Yes! It's pumpkin season! 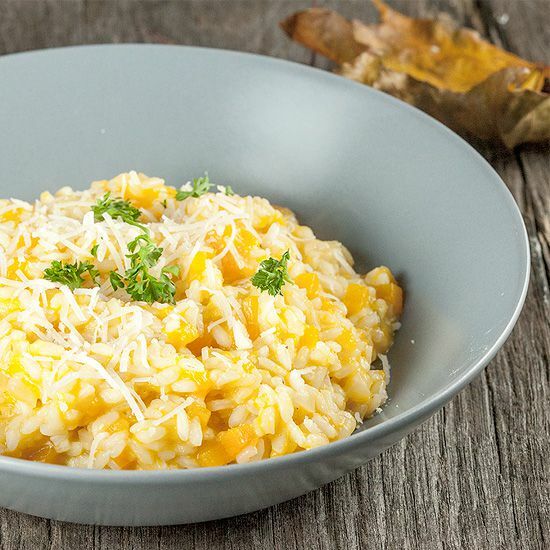 Pumpkin risotto has so much flavor to it, it doesn't need any other flavor to be added. Simple and delicious, just perfect! First you’ll need to create a pumpkin puree. FILL a medium-sized pan with water and salt and bring to a boil. PEEL the pumpkin and cut half of it in pieces for the puree. COOK the pumpkin pieces for about 10 minutes, depending on the thickness of your pieces. Meanwhile cut the other half of the pumpkin in beautiful brunoise (cubes). PEEL the shallot and garlic cloves and cut them as fine as you can. DRAIN the pumpkin pieces and use the fine sieve and ladle to create a pumpkin puree. HEAT olive oil in the large skillet and saute the chopped shallot and garlic for 2 minutes on medium-high heat. ADD the risotto rice and turn down the heat to medium. Saute the risotto rice for at least 5 minutes, you’ll notice a gloss on the rice, that means it’s ready for the liquid to be added. First ADD the white wine and let it cook until it has evaporated. Keep on adding the vegetable stock spoon by spoon, this way the risotto rice will absorb the liquid. Every time the stock has evaporated, add some more. Don’t over stir, but stir it with a silicone spatula once in a while to prevent it from burning. After about 10 minutes, ADD the pumpkin puree and keep on stirring once in a while. 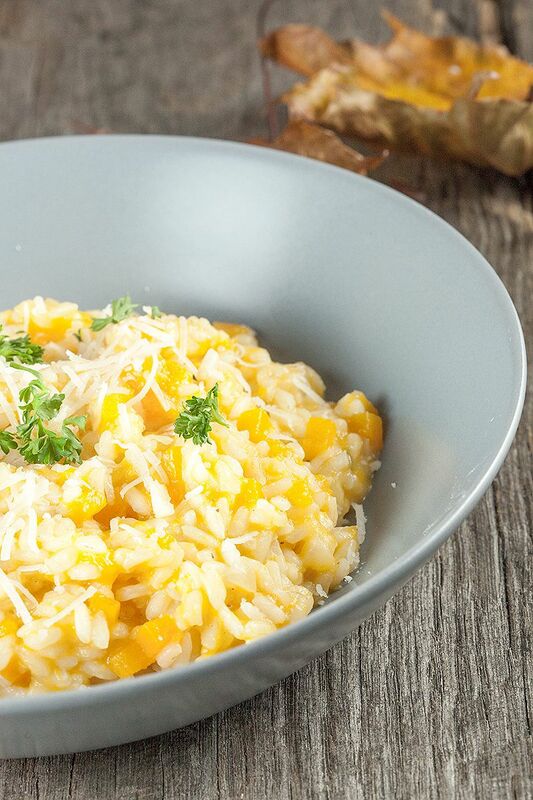 When the risotto rice is almost done, about 15 minutes later, add the pumpkin brunoise. COOK the risotto for another few minutes. 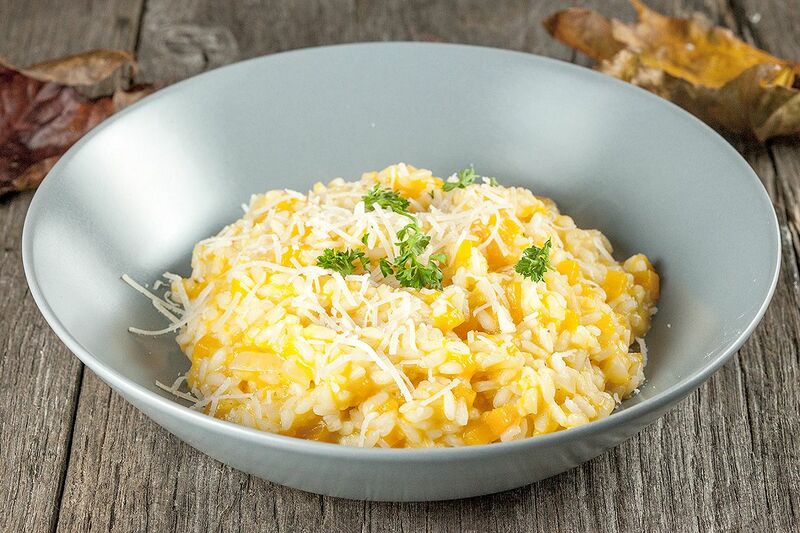 The risotto is ready when it still has a little bite to them and don’t let it become mushy! Season with pepper and salt. Serve with grated Parmesan cheese and garnish with parsley if you like.